If you’ve followed the iOS programming tutorials, I believe you should manage to create a simple Table View app with custom table cell. So far we focus on displaying data in the table view. But how do we know when someone taps on the table row? 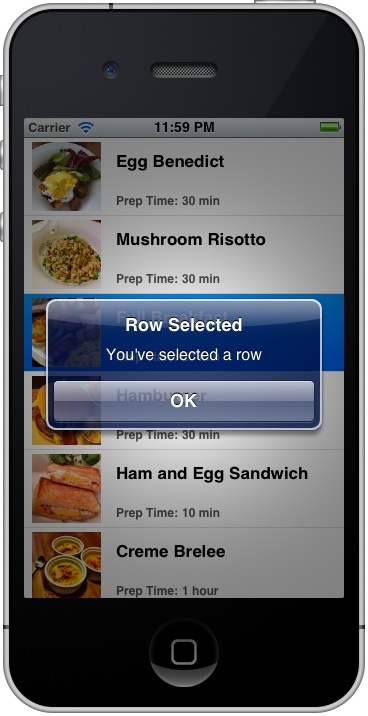 This is what we’ll cover in this post and show you how to handle row selection. 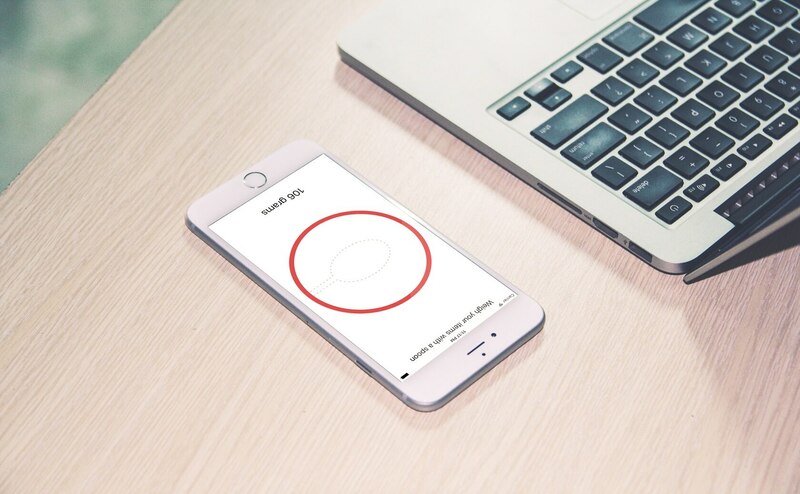 First, let’s revisit our app and see what we’ll add to it. 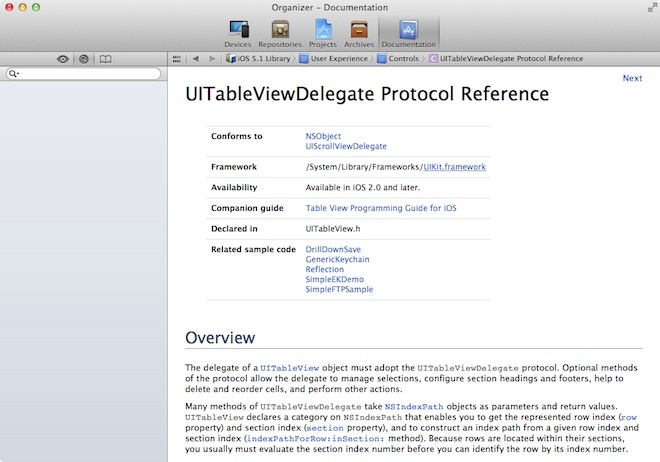 As explained in the earlier tutorial, both delegates are known as protocol in Objective-C. You have to conform with the requirements defined in these protocols in order to build a UITableView. It’s very common to come across various delegates in iOS programming. Each delegate is responsible for a specific role or task to keep the system simple and clean. Whenever an object needs to perform certain task, it depends on another object to handle it. This is usually known as separation of concern in system design. When you look at the UITableView class, it also applies this design concept. The two delegates are catered for different purpose. The UITableViewDataSource delegate, that we’ve implemented, defines methods that are used for displaying table data. On the other hand, the UITableViewDelegate deals with the appearance of the UITableView, as well as, handles the row selection. 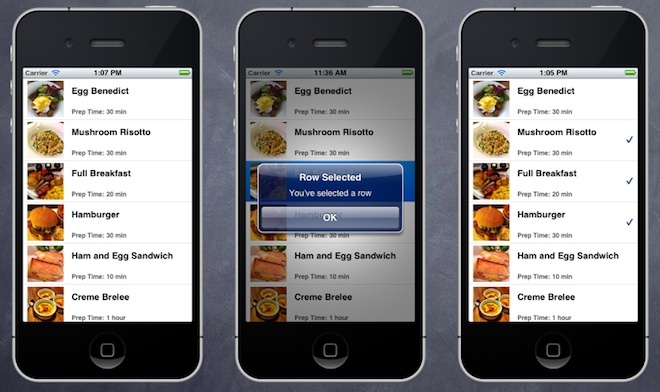 It’s obvious we’ll make use of the UITableViewDelegate and implement the required method for handling row selection. How do we know which methods in UITableViewDelegate need to implement? Okay, that’s enough for the explanation. Let’s move onto the interesting part – code, code, code! In Xcode, open the “SimpleTableViewController.m” and add the following method before “@end”. Think about how you can alter the code (hint: the indexPath parameter contains the row number of the selected row) and display the message like the screenshot shown above. It’s not difficult to do so if you’ve followed the previous tutorial. Accessory view – the right part is reserved for accessory view. There are three types of default accessory view including disclosure indicator, detail disclosure button and check mark. The below figure shows you how these indicators look like. The first line retrieves the selected table cell by using the indexPath. 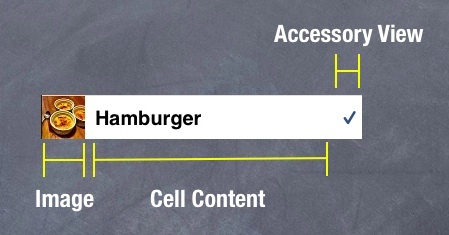 The second link updates the accessory view of the cell with a check mark. Compile and run the app. After you tap a row, it’ll show you a check mark. For now, when you select a row, that row will be highlighted in blue color. If you don’t like it, try to add the following code to deselect the row. What do you think about the series of Table View tutorials? I hope you’ve learnt a ton! 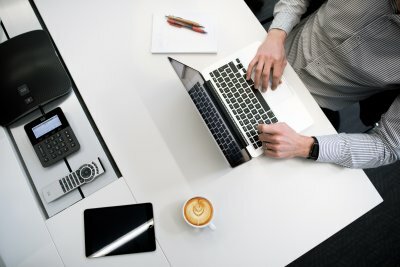 By now, you should have a better understanding about how to create table view, customize table cells and handle table row selection. Make sure you understand the information presented in the tutorials as UITableView is one of the common UI elements in iOS. If you have any questions, head to our forum and share with us. There are still lots of stuffs to learn in iOS programming. In coming tutorials, we’ll see how you can replace the recipe array with a file and explore Navigation Controller, as well as, Storyboard to build a more complex application. In the upcoming tutorials, I’ll show you how to use Storyboard and Navigation Controller to display the details of the recipes. 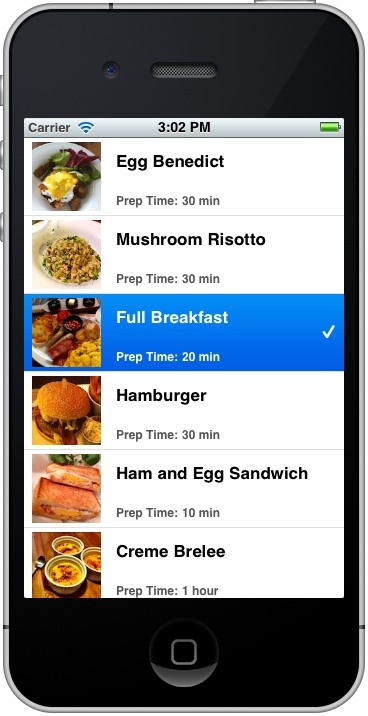 This is a recommended UI practice as you can find in other apps. these tutorials are fantastic, I just wished you had more! By the way, you should put a link to this tutorial at the end of the previous one (unless i just missed it), but I had some trouble figuring out if there was one after the 2nd table view tutorial. keep up the good work, thanks a bunch. Glad to hear the tutorials are useful. More will come in coming weeks. It’s my pleasure to share what I know about iOS programming. Also thanks for your suggestion. I’ll add a link after each tutorial. Please do more tutorials. Explanation is so clear that we dont need a video screen cast. I love tutsplus.com. What a compliment! I’ll definitely put up more tutorials. It’s really great to help people learn iOS programming. The API documentation didn’t appear for me until after I selected, downloaded and installed the api documentation under Preferences, Downloads, Documentation. Just mentioning it in case someone else doesn’t have it installed and is wondering where it is. // Created by newuser on 5/30/12. I’m running Xcode 4.6.2 and had this problem. I solved it by going to the SimpleTableViewController.xib file, control-dragging from the table view to the File’s Owner placeholder, and selecting delegate. After that, the alert box showed up when a row was selected. Hope this helps. I have the same problem, but I checked the table view has selected delegate. And the alert box still did not pop up. By the way, I run Xcode 4.6.3. Did you set the in your interface (.h) file? 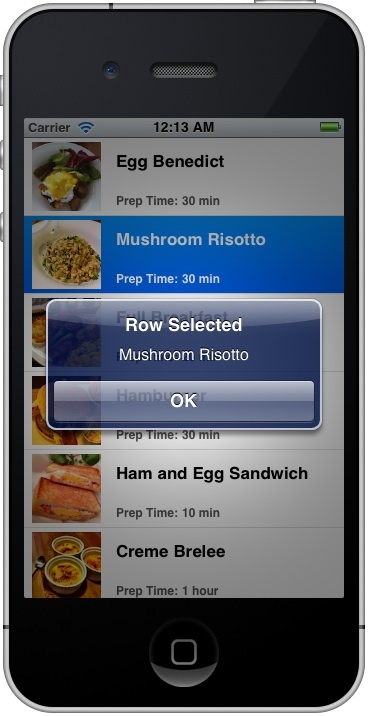 @interface SimpleTableViewController : UIViewController is this correct ? In addition to setting the UITableViewDelegate and UITableViewDataSource, did you also set the UIAlertViewDelegate in the interface (.h) file? Terrific tutorials! My table looks a lot like what you have and this tutorial helped greatly in achieving the look I want, but I’m stuck in an area I don’t see mentioned. In didSelectTableViewCellAtIndex, I’d like to make a tweak to the text – say make it a different color. How do I get access to it? I can get to its accessory type and background, but can’t see how to get to the custom UILabels and custom UIImages. you need the (myCustomCell *) in order to “cast” your custom cell to tell the compiler to expect it a UITableViewCell. I’m not sure if this has been addressed, but there are some things I would like to know about and see if there is an easy way to fix them. For instance, after selecting a row, it displays the message and shows the checkmark, however, upon scrolling further down the list, I found that every 6 rows, another row displays a checkmark as well. What is causing this? Additionally, I would also like to know how to clear the checkmark from the selected row. Thank you for your tutorials. They are a joy to follow and learn from. Keep going! Quality tutorials. Don’t think I’ve seen any better. Well done! These tutorials is such a great stuff. It’s better source of knowledge about programming than my lectures in college will ever be. But I have this little issue with my program after this tutorial. Alert never pops up after first clicking. It shows up after second (and then the check-mark arrived) and always give me information from last selection, not the current one. Could You give me a hint about it? Same issue than me, drove me crazy. Yor method is “didDeselectRowAtIndexPath” that takes the value of the “last selected”. Change it to the right one “didSelectRowAtIndexPath” and works fine. You’re just genius. Such a small thing, and I just cannot find it! Thank You so much! Wow, thank you very much! Had the same problem and was losing so much time trying to find what was wrong… Completely missed it! Thanks for all your help with these tutorials, where do you find the source code so we can debug our little problems that some of us run into once logged in to appcoda? might be a spoiler – but understand perplexing for very new coder. This worked. How would I do something like “[tableData objectAtIndex:indexPath.row] selected”? Tutorial works fine, EXCEPT that checkmark also appears 7 items down from item checked. Any solutions?? The same for me. It seems the bug in the tutorial. Cells with checked marks are reused and checkmarks are not preserved. The solution is to store marks separately and restore values back in functions -(UITableViewCell *)tableView:(UITableView *)tableView cellForRowAtIndexPath:(NSIndexPath *)indexPath. Sergiy, I don’t understand your reply. Can either you or Simon clarify? there are probably a couple ways to solve this, but the first one that comes to mind is creating another array that stores whether or not a row was previously selected, and if so, draw the checkmark. Although this isn’t a super elegant solution you can do this. did this work? any elegant solution found so far to address the multiple check issue? I’m just starting (again) to learn making Apps, and so far these tutorials have helped a great deal. I think they are even better than the “for dummies” book I got last year. Short, simple, and small bites at a time, no deep explanations but hands on. I love it! Nice tutorial but I’m experiencing the same issue as YOPA – the checkmarks repeat every 12 cells. A fix has been suggested but I am unable to interpret what needs to be done in order to correct. Can you clarify or submit an update to the tutorial to eliminate the repeating checkmarks? 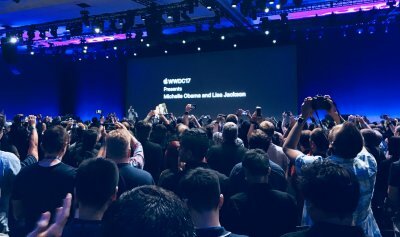 Awesome introduction to iOS and Objective-C!!! Hiii. i always use to follow your tutorials, and i really enjoy alot. But now iOS 7 has released.When will you introduce tutorials for iOS 7 or about the changes that has been introduced in iOS 7.
how to make our apps compatible for iOS 6 iOS 7 both .? after select a row , i dont want select it any more , so how can i do it ? 2 years ago I was distracted in the mobile world, which led me to start programming in C# for Windows phone. This year after trying to get involved in some kind of Entreprenership Startups, I soon realized that I was on the wrong track. Thaks to you all and to AppCoda I am getting a huge kick start in iOS programming. This web portal is very good and has the fundamental for a good start. This project not working for me. When i check only one cell, then are checked many cells, not one. – Scroll stops at the cell 14 … doesn’t reach the end of the table. – Highlighted cell is gray, even though I had selected “blue” in the SimpleTableCell.xib. – When I select a cell, a second cell, down in the view, is also checked. did anyone manage to solve this? by the way, thanks Simon for the tuts. really impressive! I’m pretty sure “gray” is the new blue for ios7 if you catch my drift. I’ve tried both selections in my xcode and they are always the gray colour. Let me know if there are issues with this it worked for me. Any code you can post up so i can have a look? Sorry Disqus wasn’t notifying me of comments – if you are still encountering the issue post up your code and i’ll have a look. for me an error box is appearing near the void area it says that. invalid argument type’void’to unary expression. what am i supposed to do now!?? PLease correct the project as its selecting many rows while selecting only one…. appcoda is really helpful and we we expect quality code from it..
Hello, it is very good tutorial about table view. everything is very clear and sharp. thanks a lot for making such efforts to let other people know. Post up your code and i’ll have a look. thank you. here it is (using xcode v5.1.1).. I am very new to Xcode but have done rails and php so not new to programming. I find that most iphone/xcode tutorials tried simply do not work. As a newbie have no idea what the error messages mean and as usual Google is helpless it reverts to StackOverflow which is for experts. For me, the **only** Tuts_to_work_first_shot so far are these. Well Done, Excellent tuts, easy to follow well thought out and no verbal guff between the explanations. This guy is a great teacher. I will do all of these with enjoyment and recommend them to others. Thank you again. Im on xcode 5 my checkbox is only showing up on the similator when I choose resizable phone but not on iphone 5 or 6. I am guessing I need to change the size of my main story board? How can I get it to fit the simulator screen? Great tuts by the way. but it will work if I put message:@”whatever message”. Not able to figure out the error. When I try to implement the tableView didSelectRowAtIndexPath method as written above, I get an error – “invalid argument type ‘void’ to unary expression. I don’t know why void doesn’t work, since there is no return value in the method. I’m running XCode 4.6. My UItableviewcessory not this showing! someone could help me ? there is bug in your project ,, you cant select 0 index of the product show in uitableview controller . and another bug is when user select (Ex:- 2,4 index value) and scroll the view then it show any two index values randomly selected (with check mark)…. plz give me solution…. when i scrolled tableview cell then check mark is been check many other row which i never select after scroll top index will be change. Awesome Tutorial Series . Very much helpful for people who intend to learn ios developement . In Handling Row Seleciton , the tutorial didn’t address the problem of wrongly updating the acessoryType for any row because of the reusability of UITableViewCell object . It would be nice if it is given as a HomeWork for learners to figure out reusable UITableCellView (or) update the article to have a back up collection that tracks the Selection of Cells . how to delete Multiple selcted table cell on button click?